The Three Gorges Region, one of the ten most famous tourist destinations in China, is the cradle of ancient Chinese culture. Xiling Gorge, Wu Gorge and Qutang Gorge cover approximately 240 kilometers. 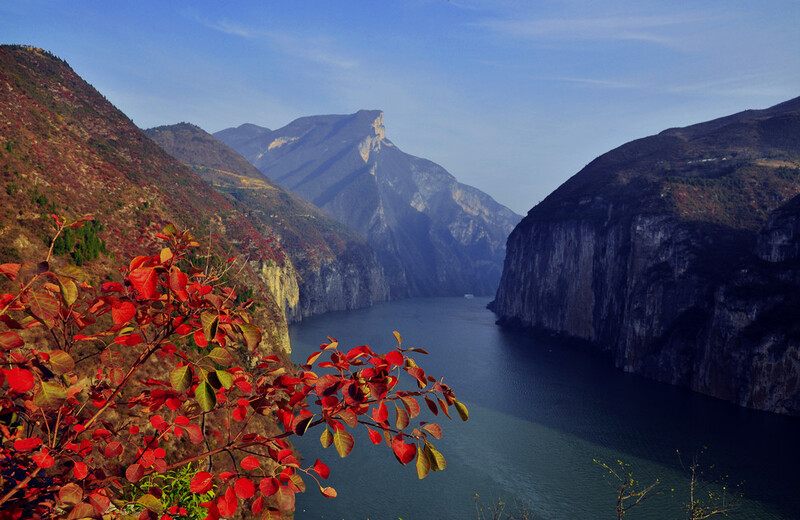 Qutang Gorge, located in Fengjie County, is the one which embodies surging characteristics of Yangtze River. Qutang Gorge, extends 8kms west from Baidi Mountain Fengjie County and east up to Daxi Town, Wushan County, is the shortest one of the three Gorges. But the cliffs on both sides are as steer as sliced by axe, only a line of sky can be seen in the narrow gorge. Hence many poets are marveled by the step and precipitous natural spectacle. 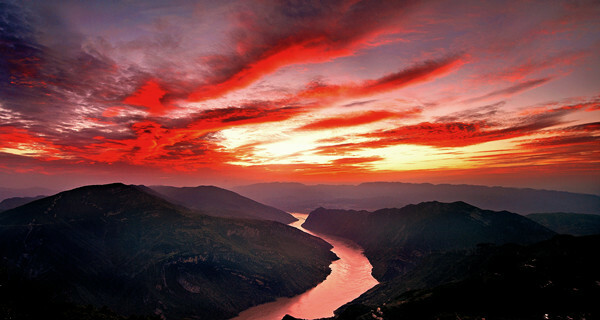 Wuxia, also known as “Great Gorge”, stretches 40kms eastward from Daning River, Wushan County, Chongqing Municipality, to Guandukou, Badong County, Hubei Province, and is famous for the gracefulness. Along the zigzagging gorge, strange-shaped mountain peaks and continuous rugged rocks from the most beautiful gallery among the Three Gorges. The Goddess Peak, alias Wangxia Feng(Viewing-the-glow Peak) and Beauty Peak, is one of the twelve peaks, located on the northern bank, 15kms east away Wushan County Town. A huge rock towering among the rosy clouds, just like a slim and beautiful young lady, and it was hence named as Goddess Peak. The Three Gorges Dam Project is the world's largest water conservancy project. This great dam brings various benefits, including flood control, power generation, irrigation, water supply, shipping, tourism, ecological protection, and environment purification. 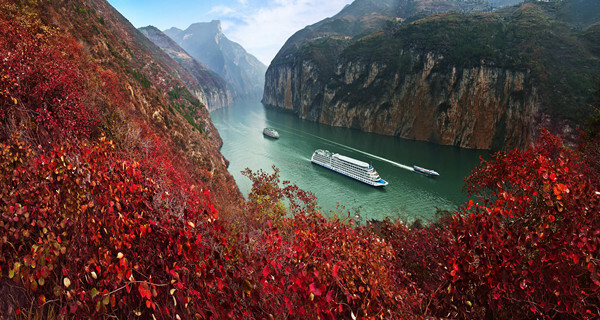 The best way to view The Three Gorges is to take cruises along the Yangtze River, and the best time for traveling the Yangtze is in either April or May in spring, and between September and November in autumn. There are currently five cruise companies operating 25 cruises. Every cruise line is generally the same, offering 4 and days 3 nights leaving from Chongqing to Yichang, or leaving from Yichang to Chongqing. The price is range is between 1200-2000 RMB/person, depending on the type of cruise, date, and room class, with varying rates. Foreign guests, depending on their country of origin, will have different fees. The following recommended cruise contains the tickets fee of the scenes the ship docks during the trip. While the Yangtze Gold cruises don’t contains ticket fee for Shimenzhai. The cruises basic facilities include hair and beauty salon, fitness center, laundry service, reading room, chess and card room, Chinese and western restaurants, bars, conference rooms, etc. Day 1: We board at Chongqing’s Chaotianmen Port. The cruise set sail at 9:00 in the evening, meaning we can enjoy the night view of Chongqing as we depart. Day 2: We wake about 7 AM, the ship hosts shadowboxing (Tai-Chi-Chuan) exercise begins on the deck, lead by expert teachers. Every traveler is invited to join in. Early in the morning, it is quite relaxing to do some traditional Chinese shadowboxing exercises. This is followed by a multilingual orientation that specifies the information about this trip, including the schedule, cruise lines information, and other information. The ship arrives at Fengdu, the famous Ghost City, at around 9 AM and we dock there for 3 hours, so we can go ashore. The next stop is Shibaozhai. The ship docks here for 2 hours or so. A landmark building, this all-wood pagoda is known as one of the world’s eight most exotic buildings. It is a remnant of the original three gorges landscape, much of which was changed following the completion of the Three Gorges Dam. Here you can ascend a tower to overlook the Yangtze River. Day 3: We wakeabout 7 AM, and again the ship offers shadowboxing. The ship arrives at White Emperor City shortly, which is a historically famous city known for its allusions throughout history. The ship docks there for 2 hours and you are free to go ashore. Many great poets wrote famous masterpieces here in ancient China, but if you are not familiar with the history, or if you are not interested in it, it may just be an ordinary place for you. The ship passes through Qutang Gorges around 10 AM and you can have a good view from the 6th floor deck. After that, the ship continues along to Shennuxi, which is called “beauty stream” because of the crystal-like water and fancy hills along the banks. It is worth going to see this. At 1700 ( 5 PM), the ship arrives at Wu Gorge. Wu Gorge is long and narrow, and has less sunshine, so fog always lingers on the water and hills. Many traditional Chinese landscaping paintings depict the views here. At night, the cruise will arrive at the five-stage ship lock. It usually take 1-2 hours to pass through the locks. After the cruise passes the locks, it is as though the ship has taken an elevator to descend over 120 meters. It really is the world’s greatest lock. From the deck, you can have a view of how the ship goes descends those 120 meters. Day 4: At 8 AM, the cruise arrives at the prestigious Three Gorges Dam. You have 3 hours to go ashore for viewing. The ship leaves for Xiling Gorge at 11 AM. Xiling Gorge is known for its distinctive steep cliff along torrential water flows. It is the last scene of this trip, the ship arrives at Yichang around 12pm, and the trip ends. 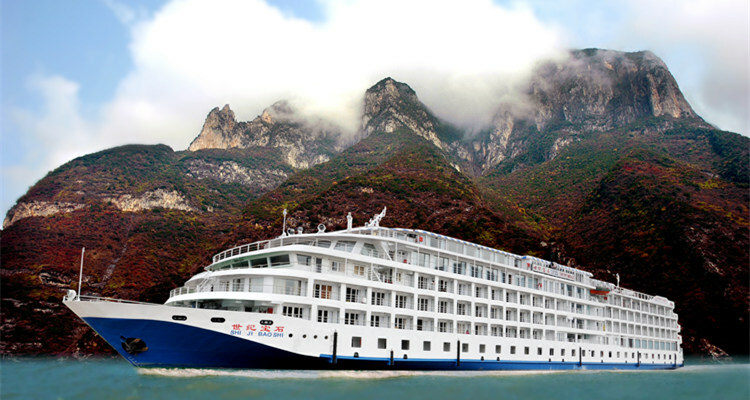 Features: Victoria Cruises is the only American cruise line currently sailing China's Yangtze River. They proudly offer departures year-round with international multi-lingual cruise directors. Passengers can also pay by Visa, MasterCard or American Express. A key difference between Victoria Cruises and the other Three Gorges Cruise Companies is that Victoria Cruises also runs a line between Chongqing and Shanghai. Features: The only cruise ship with helipads and the lowest noise level of any ships on the Yangtze River. All rooms have independent viewing balconies, so visitors can privately enjoy the magnificent landscape of the Yangtze River at any time. Features: Cruise ship is decorated with a goddess sculpture, reliefs, and drawings based on the three gorges fairy tale goddess culture. Tourists on this cruise ship can learn about the three gorges goddess legends and history by viewing these cultural works. Copyright © 2016-2018 Chongqing Municipal Commission of Tourism Development | Site by Chongqing Guide Culture Media co.,Ltd.